Donald Trump would have you believe that he could “tear up” NAFTA at any given moment, but don’t worry, that’s just how they do in New York. While there has been a lot of talk about how turbulent negotiations have been between Mexico, Canada, and the U.S., it’s more likely than not that NAFTA will be here to stay. Trade deals are never easy—they always take years to set up and any attempt to adjust them adds months to the process. Often, one party will ask for things they know they’ll never get, just to be able to negotiate down to what they actually want, while appearing as if they’re settling for less. The nature of the negotiations being made in NAFTA are not unusual, though the rhetoric from the U.S. is, of course, highly unusual. America has been asking for some big changes and Canada isn’t giving in. For one, the U.S. wants to see an end to supply management and the independent dispute settlement process, and an added clause that would require all three countries to re-sign every five years to keep the pact active. Canada isn’t moving on any of these. Supply management is an understandable pain to the Americans. It also was to other countries during the Canada-EU and TPP talks. In Canada, marketing boards control tariffs and the price of various food goods such as eggs, milk, chicken, and so on. This is a form of economic protectionism that makes American goods uncompetitive, and there have been opponents to this practice for that reason. Self-described libertarian Maxime Bernier came within percentage points of becoming today’s Conservative Party leader, but many believe he lost conservative-voting farmers who enjoy supply management. It’s estimated that only 13,500—or about 8 per cent—of Canadian farmers benefit from supply management. The U.S. takes similar measures as well; Trump recently put a 30 per cent tariff on imported solar panels. The idea is to protect domestic manufacturing and look tougher on China, but this comes at the cost of slowing down green energy growth in the U.S.
As it stands, Canada is the number one import trading partner of 22 states. When it comes to agriculture, Canada is a massive market to farmers in the northern parts of continental America. Some might argue that Trump has put himself into a very politically advantageous position. 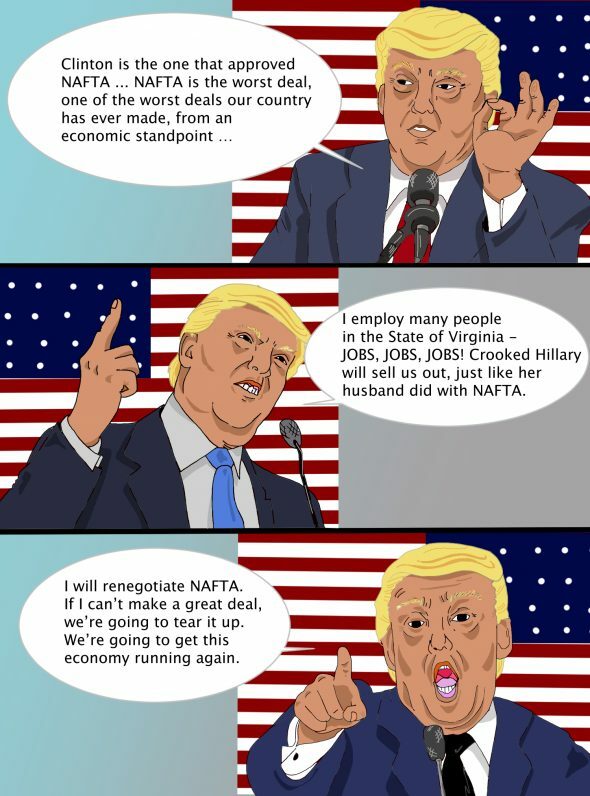 He can get an easy win whether NAFTA continues or fails, as he marketed himself as a “negotiator” in the election and talked up his willingness to leave the deal as he had done with TPP. In practice, however, that might not be the case. Farmers are intimately familiar with NAFTA’s benefits and drawbacks. It’s in their best interest to see a NAFTA that’s tweaked more in their favour, but “no deal” is actually worse. Farmers for Free Trade have argued that losing NAFTA would cost the pork industry in the U.S. an extra $130 million USD per year, and farms already run on extremely tight margins. In the rare event of a NAFTA failure, Canada and Mexico would surely suffer far more than the U.S. would, but it would be bad for everyone. There would likely be a loss in value of the Canadian dollar, but it would magnify the geopolitical appearance of a withdrawing United States and make them look less cooperative. Regardless, the only thing that’s really unusual about these negotiations is the way Trump communicates it. Any other president would be saying, “We’re having lively discussions at the moment,” but Trump—being Trump—is going to say whatever will put you on the edge of your seat while you wait for commercials to end.